This stew is rich and tomato-ey and a real winter warmer. This is a dish we served the first year Three Blue Ducks opened in Falls Creek about five years ago. On a hike into the mountains in the pre-season, we saw enormous numbers of rabbits, and started thinking about how to use this animal that was so familiar to the locals. 1. Put a large cast-iron pot with a lid on a high heat and add the olive oil. 2. Season the rabbit and brown it well on all sides in the pan for some nice, dark caramel tones. Remove the rabbit and set aside. 3. Add the garlic, chilli and onion to the pot and cook until the onions are slightly translucent. Add the leek and cook for 2-3 minutes. Add the fennel, cherry tomatoes, riesling and herbs and bring to a simmer. 4. Add the rabbit, put the lid on and let it simmer on a low heat for 2-3 hours. Check regularly for tenderness and give it a stir to stop it sticking. The cooking time depends on the size of the rabbit; the bigger it is, the longer it will take to make the meat tender. 5. (Optional) Serve with Paris mash and your favourite roast vegies. 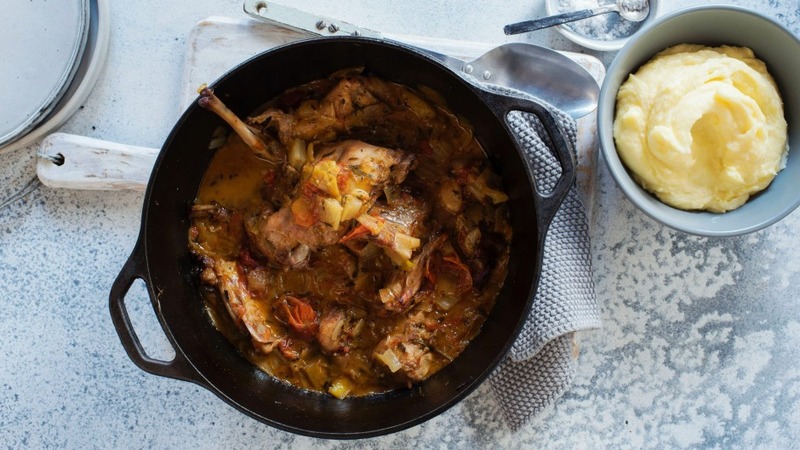 Tip: You can substitute veal shanks for rabbit.